Tired of struggling to get your dog to take pills? 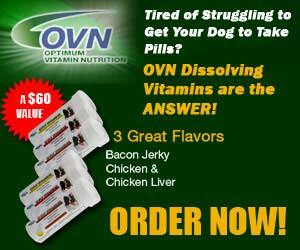 OVN Dissolving Vitamins are the answer! Anyone whose family includes a dog knows that getting Fido to take his vitamins is even harder than getting the kids to eat spinach. Rather than having to shove a horse pill down your dog’s throat or “hide” it in its food only to have it spit out, these innovative new vitamins can be added straight to the water bowl or poured over food. And because they come in flavors like chicken, bacon jerky, and liver, your dog will be able to stay healthy and happy.